Golden yellow. Aromas of peach, orange oil, candied lemon peel, truffle and honeyed raisins. Multi-layered and complex, with luscious stone fruit and ripe citrus flavors complicated by sweet spices and a touch of clover honey. The finish is long and vibrant, leaving the impression that the wine is less sweet and dense than it really is. Precise but less concentrated than the 1996, this strikes me as a more civilized and discreet version than many Pinot Gris SGNs in Alsace. 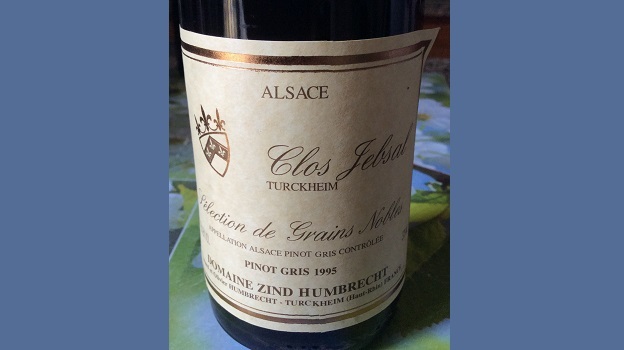 The Clos Jebsal, situated just below the Brand grand cru, benefits from a very warm and precocious micro-climate and is a veritable noble rot magnet. In fact, since 1989 the Clos Jebsal has produced nothing but Vendange Tardive or Selection de Grains Nobles wines. Most importantly, the soil’s grey Keuper marl holds onto water well, preventing water stress and ensuring production of memorably sweet wines that are never cloying (and this despite residual sugar levels often exceeding 300g/L). The wine’s name refers to the fact the site is a walled vineyard (clos) and a place rich in gypsum (a geological formation characteristic of this specific vineyard and that helps produce very precise, refined wines). 93/Drink 2016-2025.